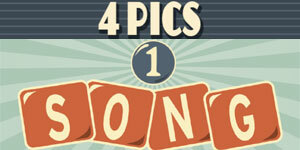 You've found 4 Pics 1 Song Answers. This is the best fan site on the internet dedicated to the game 4 Pics 1 Song. Similar to other 4 Pic games that are all the rage, the twist with this one is that the four pictures represent a song title, that you have to figure out. The pictures can be clues to the title or the artist. It's great fun and 4 Pics 1 Song Answers is here to provide answers and cheats for all levels if you get stuck and need help.